TMJ disorder, sometimes simply called TMD, is a serious condition where in the temporomandibular joints, which connect the mandible to the rest of the skull, are overworked. When the joints and the muscles around them are misaligned or have to put up with excessive amounts of stress, you may begin to experience a long list of annoying — and oftentimes painful — symptoms. In many cases, the exact cause of TMD remains a mystery. In other instances, though, there are strong correlations between the condition and other factors within a patient’s life. Let’s talk more about possible causes of TMD, how you may be able to prevent it, and why getting treatment is so important. Are female. Women tend to report TMD more often than men. The prevalence of the disorder in women may be related to hormones, joint structure, or vitamin deficiencies. Grind or clench your teeth. Habitual grinding and clenching place extra stress on the TMJ. Facial trauma. If you suffered a traumatic jaw or facial injury, it could have long-term effects on your TMJ health. Just like other joints in the body, the TMJ is vulnerable to arthritic pain. Poor posture. Poor posture can do more than just make your back ache. Sitting or standing improperly can pull on the muscles that control your jaw, leading to TMJ pain. A stressful lifestyle. Serious and sustained emotional distress can affect hormone levels and cause muscle tension in the jaw. Be mindful of what your body is doing. If you notice that you grind or clench your teeth, or you have poor posture, do your best to train yourself to get away from such habits. 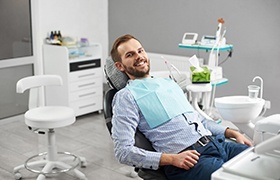 If you grind or clench your teeth while you’re asleep, your dentist in DeLand can design a special mouthguard to help you conquer your problem. Take time to unwind. Being aware of and responding to your emotional needs can help you keep your stress levels to a minimum. Take small bites, and chew with both sides of your mouth. Careful eating habits can reduce the amount of strain that you put on the TMJ and the surrounding muscles. Avoid excessive chewing. While chewing gum can be good for your teeth, doing so for too long or too often might make your TMJ sore. It’s also wise to minimize your consumption of sticky, chewy foods. Protect your jaw from injury. Wearing a mouthguard during sports, and always being aware of your surroundings, may help you prevent injuries that lead to TMD. If you’ve been experiencing jaw pain, frequent headaches, or other symptoms of TMD, you should seek prompt treatment. Untreated TMD can lead to chronic jaw pain, decreased jaw mobility, and persistent headaches. The grinding and clenching associated with the condition can also cause excess wear and tear on the teeth. Do you suspect you have TMD? Contact our office to discover how Dr. Cowell and the rest of our team can provide TMJ therapy in Deland and help get your smile back to feeling its best.